Pension reform in the Czech Republic. The responsibility for the standard of living in the retirement age is being passed from the state onto the citizens. 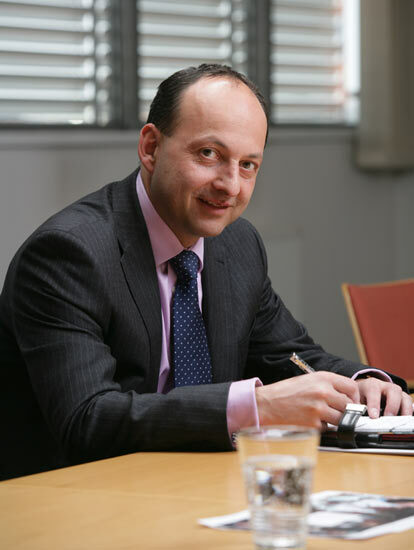 Pavel Jirák Chairman of the Board of Directors and CEO of the Penzijní fond Komerční banky (PF KB) which won the 2012 Czech Pension Fund Award provides some details about the situation of the reform. The Czech Republic’s crucial problem stems from the relatively unique combination of a rapidly aging population and the fact that the state provides for virtually 100% of pensions. This system is unsustainable in the long run and is unfavorable to all of the country’s population under 40 men and women alike. Unless we commence a reform our pension system would collapse in a short time. The state would have to consume increasing parts of the country’s GDP to fund pensions and would gradually find itself in the middle of a severe intergenerational conflict. The main aim of the reform is to make the population use multiple diverse sources for their pensions and stop relying on a single source, i.e. the state. 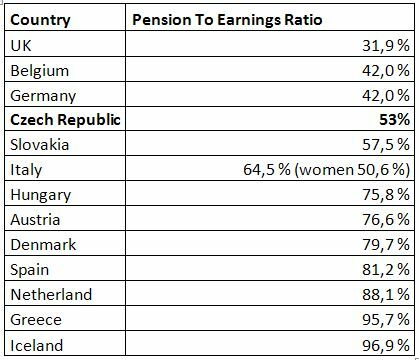 The Czech Republic’s state pensions are on average equal to approximately one half of the money earned whereas pensions in Austria, Denmark or Hungary reach three quarters. The average salary in the Czech Republic reached approximately €973 before taxation, or €760 after taxation at the end of last year. Roughly one third of the population reached the average wage. The average pension reached €422. Men received on average €468 and women €383. Unlike pensioners in other countries an overwhelming majority of Czech pensioners rely solely on the state pension. The chart shows that regarding the relation between pension and salary Iceland and Greece whose population enjoy nearly 97% of the average earnings are at the top. However Greece found itself on the brink of bankruptcy and has to make drastic cuts that will affect the standard of living. Italy and other countries have also come up with strict saving measures. On the other hand Great Britain has the lowest average state pension in relation to average earnings. Most of the pensioners’ income is provided by its optional part – the state pensions by the pay and many different insurance schemes. In this way the basic pension which is determined according to prices and which is equal to roughly €512 per individual rises to the average of some €1,241 per month. “The small pension reform” that came into effect on 1 October 2011 contains a significant change of the retirement age. People born after 1965 will be allowed to retire after they reach the age of 65. The pace at which the retirement age increases will also accelerate to six months per year in the case of women and two months per year with men. “The grand pension reform” is different from the small one in that it will allow people to take some of the money from the current pension system to newly formed pension companies and save money in private pension funds. The Czech Republic’s pension system will newly feature 3 pillars. The key changes will become effective on 1 January 2013. The PF KB has been preparing for the reform for several months. All nine domestic pension funds view the reform as a challenge and most are planning to participate in pillars II and III of the new pension system: i.e. to set up pension companies and to transform existing funds. We have already contacted the Czech National Bank with our request for a licence enabling the PF KB to operate in both pillars of the pension system as well as an application for permission to provide supplementary pension insurance through our transformed fund, stated Pavel Jirák. We have detailed each step required to carry on the necessary changes in pension funds as well as the commercial offer for participants who newly enter the system. The pension savings system will newly consist of three pillars. What will become of the existing pension funds and how do they fit into the new system? The existing state pension system is the pillar I; the pillar II includes the newly formed pension saving in pension companies while the pillar III represents additional pension insurance with state contribution created by transforming the existing one. The pillar II of the pension system will have the form of opt-out. By entering the pillar II participants grant their consent to transfer three per cent of the existing social insurance payment from the pillar I to a pension company on condition that they also add two per cent of their gross salary. It means that the employer will remit five per cent to pension companies on behalf of the employee. The pension company will invest these resources in order to create another source which will be used for funding a lifelong pension or twenty years’ pension after the employee retires. The decision to enter the pillar II will be optional and will be suitable especially for young people whose earnings exceed the average. People over 35 years of age have to make this decision within the first 6 months of 2013. Entering the pillar II will mainly favour self-employed persons and entrepreneurs, who will be allowed to remit nearly half of their pension insurance to private accounts. Self-employed persons remit 6.5 per cent of their income to pension insurance now. The participants of the pillar III will enjoy an increase of the state’s allowance while the tax deductions and the possibility to claim a contribution from the employer will remain as they are now. Other benefits such as one-off payment when one reaches the retirement age will also remain in place. This is why I consider the pillar III to be one of the most attractive financial products on the market. The transformation will especially mean a separation of the participants’ property from the shareholders’ property and hence more transparent management also. The PF KB will become a pension company which will manage 4 funds for the pillar II and 5 funds for the pillar III. The funds will differ in the height of the risk. The riskier the investment the higher the expected profit but also the higher volatility or the less certainty of the fund’s profitability in the given year. As the participants’ retirement approaches the savings are automatically transferred to less risky and finally to safe funds. The reform will bring several advantages to current participants in pension funds as well as to those who will enter the system by the end of November this year. The transformed funds will retain their current guarantee of non-negative profit each year. At the same time they will be allowed to decide to opt for the new funds of the pillar III at any time. What makes the PF KB attractive for clients? PF KB informed the public about the pension reform openly and its parameters in the course of last year and continues in this effort. I dare say that all our participants have been offered a chance to become familiar with the reform if they wished to do so. We have also published a number of articles and interviews for the country’s broader public; we provide information on special phone lines and at the offices of subsidiaries comprising the Komerční banka Group. Our website (www.pfkb.cz) contains a special section dealing with the pension reform with some practical sample questions and answers. Our intensive information campaign will continue this year so information about the pension reform can reach each responsible citizen who does not wish to make light of their provisions for retirement. We believe that the fact that there is sufficient information and maximum openness on our part is our existing and future participants’ crucial advantage. Other benefits include advantageous offers of recreational and spa stays in the Czech Republic for our clients. I should not forget to mention the foreign awards that we have won. In addition to the prize awarded by the GBAF, the World Finance magazine announced the PF KB the “Best pension fund of the year in the Czech Republic” also. We´ve got both these prizes for the second year in a row, says Pavel Jirák happily. Repeated awards from expert juries prove that the PF KB is the right partner for entering the system of additional pension savings.